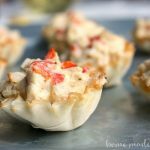 Baked Crab Bites are a simple seafood appetizer served in a crisp phyllo cup. Heat olive oil in a small pan over medium heat. Once hot add onions and garlic and saute until softened, 2-3 minutes. In mixing bowl combine onion, garlic, red pepper, mayonnaise, lemon juice, old bay, cream cheese, and Havarti cheese. Mix until completely blended. Fold in king crab meat. Fill phyllo cups with mixture and bake for 15 minutes.